You can fall off, but it only changes what you do. We’re talking about the 3 specific wind ranges when sailing downwind. Grab you polar and follow along. What we’re talking about are the three wind speed ranges where your boat’s downwind behavior acts quite differently. The actual true wind speeds for your boat may vary; longer boats transition at higher wind speeds. However, you will be able to tell about where your boat transitions once you become aware of the cliff area. Below about 8 knots, the boat is comfortably below hull speed and produces less drag. Because this is a lower load on the sails, they still act as wings, giving you lift, and allowing you to point higher (lets call that downwind angle). Between 8 and 12 knots, the hull resistance builds up, and the sails begin to transition to drag mode. 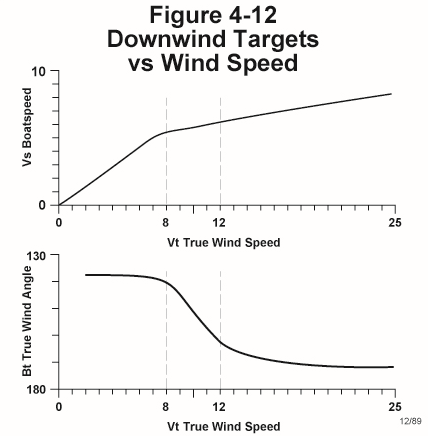 As a result, your downwind angle gets less fairly quickly the beginning of the downwind cliff. Above 12 knots, the sails are in full drag mode, and your downwind angle gets small. You are at the bottom of the cliff now. If you aren’t in the downwind diamond, it’s just a reach. When you are inside the downwind diamond, your objective is the downwind sailing equivalent of tacking in the upwind diamond. You want to maximize your Vmg downwind. And boat handling changes dramatically depending on where you are relative to the cliff. Because there is very little loss involved in jibing, you can pump your lateral separation to your heart’s content. Because the downwind angle is large, the downwind diamond is also large. You can “tack” downwind effectively, taking advantage of wind shifts and moving to the favored side of the course. Remember that in this regime, the sails are still airfoils, not parachutes. This means you have to watch out for “stalls”, where the flow on the sails breaks. When this happens, you have to head up to reestablish flow. Having a polar will help prevent you from going too deep and stalling out. The cost of jibing is much less than the cost of a tack. Also Wind shifts last longer going down wind. These two fact combined indicate that you should be jibing more often. There isn’t much tactical room to maneuver. You are just dragging down the wind. Little or no downwind tacking. In this regime the downwind diamond is very narrow, so for both reasons small diamond and small downwind angle not much downwind tacking. Another thing is that the sails are now parachutes, and maintaining air flow is not a problem. There is a lot to be gained by getting onto the correct Jibe at the mark. The jibing angle is so small in this regime there is no time for getting the jibe wrong. Here the sails change from lift to drag mode in a few knots of wind speed. Boat handling changes in and out of flow maintenance, increasing the need for concentration.